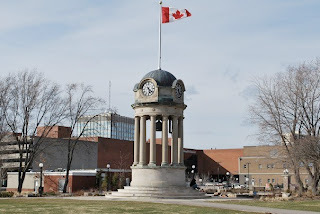 I must admit, I had been worried about our visit to Canada as I felt there was so much to do and it was such an emotional trip, going as I was to hopefully finish sorting out my parents’ estates. But to my delight, with the help of some very nice people, I had done pretty much all I could do towards that end by close of play last Tuesday, leaving me almost a week to visit with family and friends. Of course, last Tuesday was a difficult day, and really concentrated my mind on my grief at losing my parents. In another way though, it was very freeing. Obviously everything is not totally sorted out yet, but I have done all I can, and in many ways, drawn a line under the horrible feelings of loss. I can now make a concerted effort to concentrate on happy memories and move on. Although I am an only child, and there are only three members of my parents’ generation of family left, I have a lot of cousins, so it would have been impossible to visit with them all in less than a week. (My Grandpa had fifteen grandchildren and more than double that number of great-grandchildren and that is just on my Dad’s side. I have a big family on my Mom’s side too!) However, I did manage to visit with quite a lot of them. Everyone made a huge effort to get together with us even though we were only in Canada for a short time. Easter Sunday was lovely as well. My cousin and her partner had a family gathering which everyone attended so all of us from my Mom’s side were together again, save for my two cousins and my cousin’s finance who live in England like me. I also managed to catch up with two lovely friends and their families earlier in the week which was wonderful. We all had a lovely time and I’m so grateful to my super family and friends who made such an effort to see us. And so we are home again. I love to travel, but there is always something wonderful about coming home. I feel grateful to have a nice place to come home to, and newly enthusiastic about really settling in here. After eighteen months during which so many times have felt overshadowed by sadness, this feels like a new start. If that isn’t something to be grateful for, I don’t know what is!